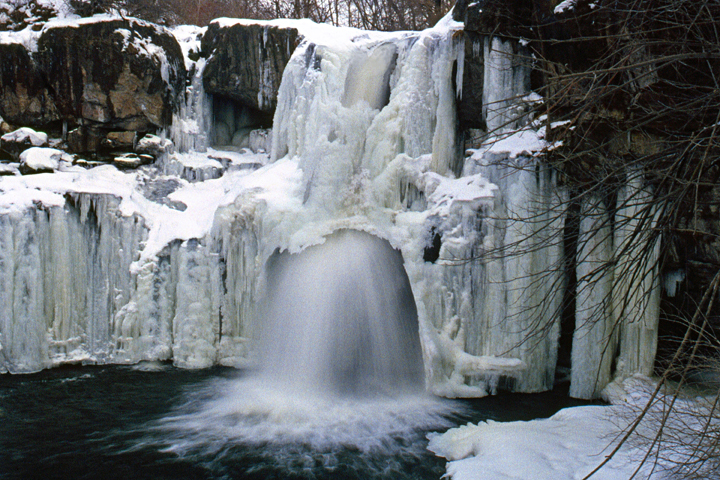 Location: Northwestern Erie County, Village of Akron, Akron Falls Park. Park in the area for picnic shelter number 4, next to a comfort station, located in the eastern end of the park. You can view the crest of the falls from a viewing area 100 feet east of the parking lot. The falls can be seen best by following a blacktop trail that starts at the west end of the parking lot. The trail descends into the ravine and turns to the east, heading upstream towards the falls. Roughly 400 feet after entering the ravine you will reach the viewing area for the falls. Please stay on the established trail. 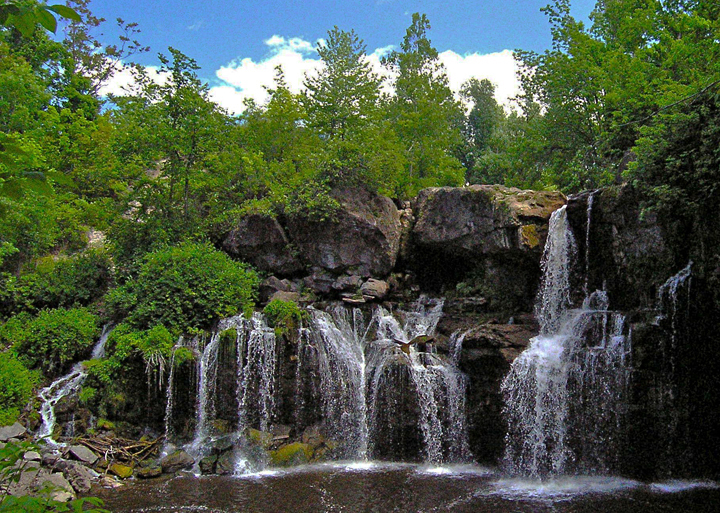 Akron Falls is 41 feet high, has a crest width of 40 feet, and faces to the northwest. By definition it is a classical falls, but because of some unique conditions, the falls usually has the appearance of a ribbon falls for most of the year. Murder Creek flows over the entire crest width of the falls only in times of high water. Usually the creek plunges from a 5 foot wide channel on the southwest side of the crest, free-falls 20 feet and then strikes a ledge. It then fans out to about 20 feet in width, and free-falls into a plunge pool. In times of very low water the stream will disappear into cracks in the dolostone creek bed before it reaches the crest of the falls. The creek then reappears from horizontal cracks about 15 feet below the crest as several springs on the northeast side of the falls. Click here for a photo of Akron Falls in flood. 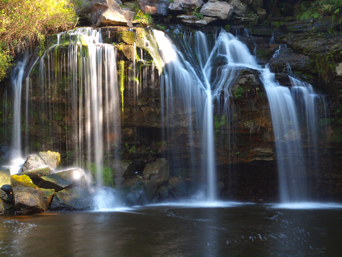 The Senecas knew Akron Falls as "Wun-ne-pac-tuc," meaning "beautiful waterfall." 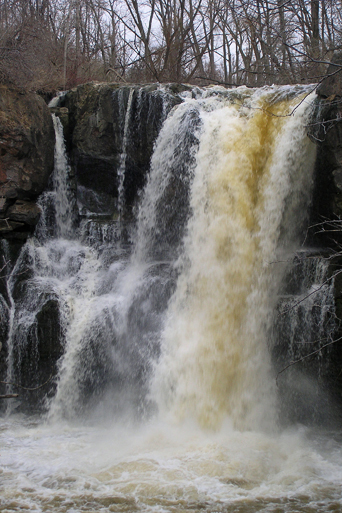 In the late 1820s early settlers of the area called the falls "Falkirk Falls." In 1831 at a meeting held to name the settlement just west of the falls, Sylvester Goff submitted the name Akron. It is uncertain if the name came from the city in Ohio, or from the scripture name "Ekron" found in the Book of Kings. Murder Creek, according to a local legend, derives its name from the slaying of a Seneca chief named The Great Fire by a settler named Sanders. Shortly thereafter, Sanders and a Seneca brave named Gray Wolf fought over the affections of a Seneca princess named Wild Rose, the daughter of The Great Fire. After a terrible battle with hunting knifes, Sanders fell dead. But Gray Wolf was severely wounded. He took a few steps towards Wild Rose, and fell dead. Sometime later Wild Rose was found cold and lifeless on the grave of her beloved Gray Wolf, dead of a broken heart. As the legend goes; if you walk along Murder Creek on a moonlit night, you may hear the voices and the footsteps of the two lovers, Wild Rose and Gray Wolf, as they wander the ancient Seneca trails. For a Google map of the area click here. For a Bing map of the area click here. 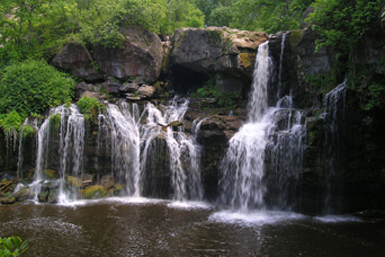 Web site: Geology of Akron Falls by Samuel J. Ciurca, Jr.